You don’t want to buy a used car without checking out its history, which can let you know if it’s been in an accident or suffered major damage. 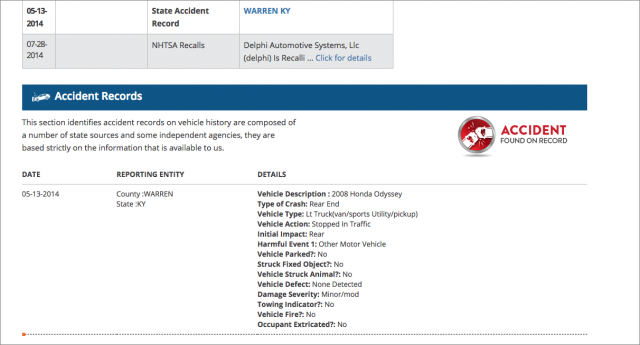 Often, the vehicle history report can even give you important clues about how well it was maintained. I once made the mistake of forgoing a vehicle history when buying a cheap truck from a neighbor and wound up with a rebuilt rust bucket that ran for just 3000 miles before dying. CarFax is the gold standard for vehicle history reports, and while almost every dealership will give you a copy for free, it can get expensive if you have to pay for the reports—as much as $39.99 each! (You can also buy three reports for $79.99 or five for $99.99.) That’s money well spent before making a big investment, but it’s a lot to pay if you’re just trying to weed out bad cars before you waste much time with them. Experian’s AutoCheck is significantly cheaper than CarFax at $24.99 for a single report or $49.99 for 25 reports, but Edmunds reports that CarFax is worth the extra money. I recently replaced our SUV, and I found a few free vehicle history tools that saved me a small fortune in CarFax fees by letting me eliminate lemons before I got too far into the process. There are a lot of scammy Web sites that claim to help with car buying, but here are three that are legitimate and useful. First, to use any of these services, you must know the car’s vehicle identification number (VIN). Unfortunately, there is no single standard for this, but in the United States, it’s a 17-digit number found on the driver-side dash near the windshield. Auto dealers should provide the VIN in the vehicle’s online listing (and offer a free CarFax or AutoCheck report as well). If a private listing doesn’t feature the VIN, ask the seller. I’ll start with the most basic: the National Insurance Crime Bureau’s free VINCheck, which is limited to telling you if the vehicle is stolen or has a salvage title, which implies that it was in an accident so severe that it’s not worth repairing. Simply enter the VIN to receive the simple report. A more full-featured vehicle report comes from iSeeCars, which focuses on pricing information—enter the VIN, and it’ll figure out the make, model, and year. 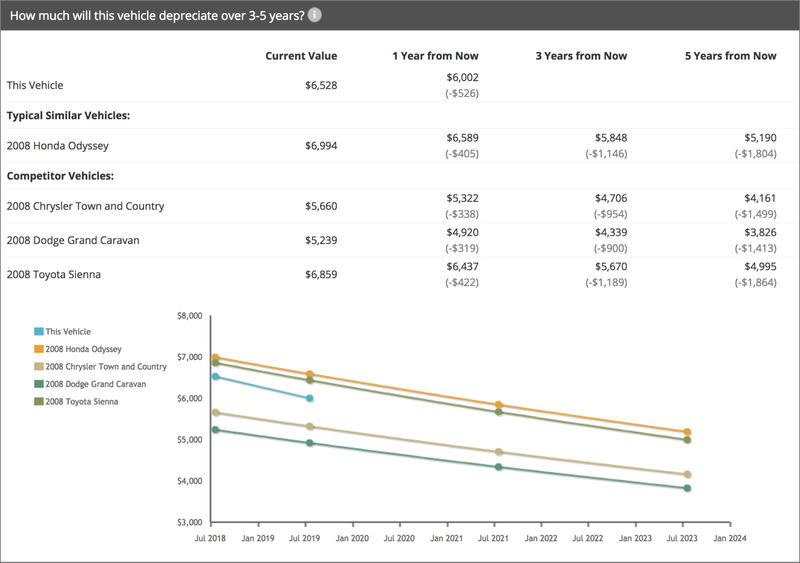 At the top of the report, it shows the estimated market value of the car and how long vehicles like it take to sell. Scroll down to see comparisons with similar vehicles for sale, depreciation, and even the best times to buy. My favorite of these free services is Vehicle History because it’s the most like CarFax and AutoCheck. You have to click through a few screens before receiving results, but the results are quite detailed. For instance, Vehicle History was able to tell me that a minivan I was looking at had been in a minor accident. I didn’t end up buying that minivan, but the report helped me lower the price (not enough, though). However, after comparing Vehicle History’s reports to those produced by CarFax, I’ve found that Vehicle History’s reports have a lot of gaps. For instance, the above report doesn’t include buyer history, which I’ve found to be valuable. As much as Vehicle History’s reports are useful for weeding out obvious lemons, you’ll want to use CarFax for cars that pass these early tests. Pick a handful of models in the category that you want. I wanted a reliable family hauler, so I winnowed my search down to a handful of models: the Honda Odyssey and Toyota Sienna minivans and the Honda Pilot and Toyota Highlander SUVs. There’s nothing wrong with being particular, but the more flexible you are, the more likely that you’ll find a good deal. Search for vehicles on Craigslist, Facebook Marketplace, and Cars.com. We ended up finding our car through a Facebook group—most areas have local trading groups on Facebook, which can be a great resource. Gather a number of potential vehicles. An orderly approach would involve a spreadsheet or an app like DEVONthink, but I’ll confess to just having a browser window full of tabs. Look over the pictures and details carefully, and eliminate any that seem substandard. When you look at a bunch at a time, you get a good feel for the market prices in your area, but you can always check Kelley Blue Book if you’re unsure. 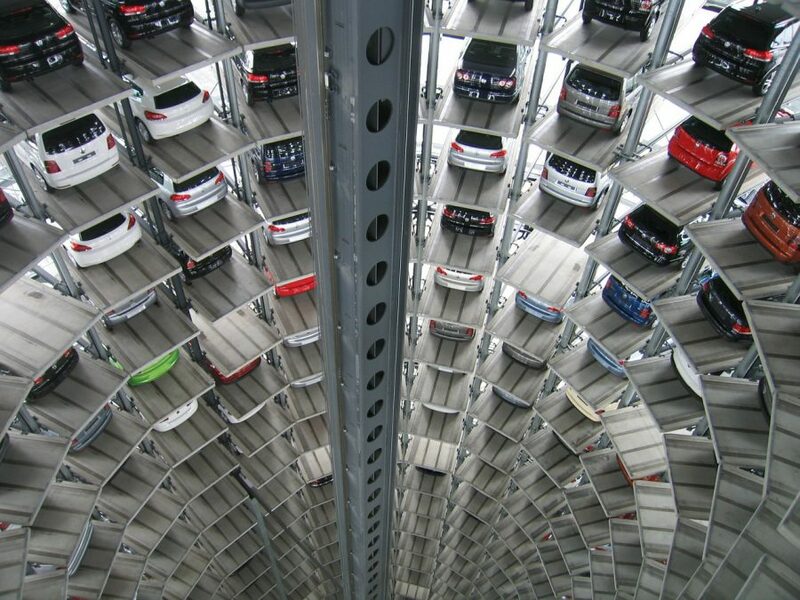 Once you narrow your list of candidates, it’s time to start looking at vehicle histories. I usually start with Vehicle History, and if that all looks good, I’ll look at VINCheck to make sure it’s not stolen, and then iSeeCars to see how well it’s priced. Finally, it’s time to move on to CarFax. When to pay for a CarFax report is a tricky question. If the car is being sold by a dealer that offers a free CarFax or AutoCheck report on their Web site, I’ll look at that at the same time as the others. Private sellers often don’t offer such amenities, so you have to choose whether to pay for a report before or after you take a test drive. I prefer to hold off until after, because I want time to mull it over anyway, and I often find deal-breakers when I inspect a car in person that no amount of Internet research could reveal, like damaged upholstery, bad smells, and rust. Doing this, I found that one report can often reveal something not shown in others, so it’s worth checking all of them before you take the plunge. Accidents, obviously. An accident won’t necessarily be a deal-killer, but it’s definitely a negotiating tool. Salvage or rebuilt titles (a rebuilt title denotes a car that was totaled and then repaired). I avoid both, but some people swear by salvage title cars. Number of previous owners. Some people will tell you to pass on any car with more than two owners. I tend to focus instead on the length of ownership. If the car has had four owners, and the last two each owned it for less than a year, that’s a sign that there’s something seriously wrong with the car. Cross-country moves. In the north, older cars tend to have rust problems, but in hotter southern parts of the country, rubber gaskets and seals may have dried out. Neither is necessarily an issue, but both are worth checking if the car has moved from a different part of the country. Tred suggests a few more things to look for, but you shouldn’t be overly reliant on any vehicle history report, since they don’t reveal all the problems that an experienced mechanic can spot. After checking the vehicle’s history, you’re ready for a test drive and, ideally, some mechanical advice. Automotive Web sites will always tell you to pay for a mechanic’s inspection. That’s good advice, but not always possible, especially if you found a particularly good deal that people will be fighting over. I used to write for an automotive Web site and would advise people to walk away from such high-pressure situations, but if I’d followed my own advice, I wouldn’t have been able to buy our most recent car. Regardless, one of the smartest moves you can make is developing a good relationship with a mechanic in advance so you can get their advice or have them inspect the car before purchase. I’m lucky enough to know three, and when we were looking at the car we finally bought, they all told me to go buy it before someone else snapped it up. That turned out to be good advice because by the time we got to the dealership another family was trying to buy the car out from under us. Finally, the most important step is test-driving the car. I could talk a lot more about that, and many already have, so I’ll leave it to them (Scotty Kilmer is always fun to watch). I’ll say this much: you want to test every feature of the car, drive it at highway speed, check under the car before and after for leaks (understand that the air conditioner drains water under the car—that probably isn’t a leak), and check for major rust. You don’t usually have to be a trained mechanic to tell if a car is a lemon. But keep in mind that every used car comes with a set of trade-offs, and you need to be honest with yourself about what you’re willing to put up with. And never forget that entropy is real. There will always be some existing problems—our car needed new dome lights, a cabin filter, floor mats, and some headrests—but there are almost always more expenditures around the corner. Thanks to this process, we skipped a lot of potential headaches and wound up with a reasonably priced Honda Pilot with a single owner and a thorough service history. I quickly fixed all the minor problems, and we’ve had several thousand trouble-free miles since. Check out these certified programs. They usually get their cars off of a lease with just a single owner. They then overhaul the cars replacing worn parts and replacing all the fluids. Some programs are better than others and the cars the dealer sells seem like the best models under the program. My second best used car buying experience was with a certified used car program. I bought a GTI from VW’s certified program and it was like new. It also came with a two year warranty which was added onto the remaining three year warranty the car already had. I ended up with a longer warrenty than I would have if I had bought the car new. I saved over $8,000 compared to a new car. My best used car buying experience is with a particular dealer in our town. He’s well known in the community and it isn’t unheard of people buying a half dozen or so cars from him over the years. I’ve bought four cars from him. I even ended up buying a car from him sight unseen. I literally called him up when I was out of town, said I needed a car, flew back home, and picked it up on my way home. Few businessmen have earned that much trust — especially ones that sell used cars. Yeah, certified is always a good choice if you have the budget for it, but even then you should investigate its history. My certified Corolla was a rental, and you could tell by the abuse on the interior: it’s obvious that someone slashed up the inside with a knife. But I’ve been driving that car for over 8 years now! I bought it intending it to last ten years but now I’m optimistic that I might get 20 out of it. Now that’s a good combination of vehicle report providers to try. Appreciate it much. I was wondering though if you have checked out this website VinCheck.info because it’s offering all of the information you mentioned in this article. What I find interesting is that it’s more like a paid service than free and it’s simply because somebody is picking the tab for your report. It’s advertiser-supported but don’t worry about popups or anything. It’s just the plain occasional ad in one corner or another. I am guessing you get the drift. Anyway, a friend from the media told me about it and that, in some cases, VinCheck.info was able to spot a salvage record or a flood record but other providers could not.